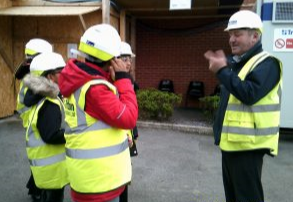 Lee Pattison our Site Manager at Premier Inn – Heaton Park had a visit from the Learning Ambassadors from the local primary school find out about the building work taking place there. At first, the children looked in a room in the Premier Inn to see what the finished version would look like. Then they visited the Triton building site and met Lee. Lee helped the children to learn about site safety. The children also found out that the new part of the hotel will include an additional 39 bedrooms and will be completed next spring. Everyone had a great time being mini builders!